In Adelaide, you can enjoy stylish architecture, boutique shopping, sandy swimming beaches, fabulous arts events, nightlife, fine dining, and some of Australia's best café strips. Population is about 1.3 million, which makes it Australia's fifth largest city and by far the largest city in the otherwise sparsely populated state. Adelaide is at least a 1 day drive away from any capital cities on the Australian east coast. The shortest route from Adelaide to Melbourne takes 8-9h. Roads are all paved, and there are some freeway sections, but it is mostly 2 lane roads of reasonable quality. Sydney to Adelaide is 1,422km (884mi) via Wagga Wagga and Mildura (National Highway 20). The road through Wagga will save you some hours due to freeway conditions for most of the way from Sydney to Wagga. Via Broken Hill (National Highway 32), Sydney to Adelaide is 1,659km (1,031mi) . Adelaide International Airport (IATA: ADL) is around 7km (4mi) to the west of the city centre. West Beach, an excellent swimming beach with plenty of accommodation is located only 4km (2.5mi) away. Adelaide's airport has scheduled international services. Air New Zealand via Auckland is particularly useful for flights to and from the Americas and the Pacific Islands. Cathay Pacific via Hong Kong is generally useful for flights to and from both East Asia and Europe and both Malaysia Airlines and Singapore airlines via Kuala Lumpur and Singapore are useful for flights to and from South East Asia, India, the Middle East and Europe. Qatar also offer flights direct to Doha on the new A350 XWB aircraft, and from there connecting to much of Europe and the Middle East. In addition, domestic flights to Sydney and Melbourne are useful for connections to the Americas, while domestic flights to Perth are useful for connections to Africa. The service to Guangzhou in China is useful for direct entry into China and onward flights throughout Asia. Adelaide is the only major Australian airport that does not have Qantas international flights. The service to Singapore ceased several years ago. Domestic services and connections are available to many major Australian cities and regional centres. Budget airlines Virgin Australia, Jetstar and Tigerair offer the cheapest domestic airfares. Adelaide is also provided with scheduled services by Qantas and National Jet Systems. Regional services and operations are provided by Regional Express Airlines (Rex), Sharp Airlines, Alliance Airlines, Cobham Airlines and Qantaslink flights operated by both Cobham Airlines and by Alliance Airlines. There is only a single terminal for international and domestic departures so transfers are relatively seamless. The airport has ATMs, currency change, food, shopping and lockers. Free Wi-Fi is available throughout the terminal. JetBuses J1, J1A, J1X and J3 link the airport with the city, operating every 15 minutes throughout the day. A ticket costs $5.10 during peak, $3.30 off-peak and includes unlimited transfers within a 2h period. Alternatively you can buy a 3 day Visitor Pass with unlimited travel for $26.60. The city centre can be reached from the airport in 15-25min. Taxis are available outside the terminal, at around $16-20 to the city centre. An extra $3 is added to fares starting at the airport. Rental cars are available. Major national renters are represented in kiosks at the terminal. Great Southern Rail runs long distance tourist train services, The Ghan runs to Alice Springs and Darwin, The Overland, runs to Melbourne, and the Indian Pacific runs to Perth, Broken Hill and Sydney. The The Ghan and Indian Pacific services are train experiences, more like a cruise on rails than a plain transport service, offering sleeper cabins, dining, off-train excursions and the opportunity to take your car with you on the train. However, they take considerably longer and invariably cost more than the journey by bus or plane - a minimum of $800 up to $2500 depending on class of service. The Overland service to Melbourne is a regular seated day train and while it still takes over 10 hours, the fares can be cheaper than or of comparable price with air fares - starting at $99 each way (red standard class advance purchase). The trains stop at intermediate stops which may not be serviced by air connections. Note that the rest of the train services are very infrequent - running only once or twice per week so you should plan well in advance! V/Line runs a daily combined bus/train journey to Adelaide from Melbourne. You can connect from NSW TrainLink trains to V/Line buses at Albury or Benalla. Greyhound Australia run services to Adelaide from Sydney, Melbourne and Alice Springs. Accurate transit directions can be obtained through Google Maps. To navigate around, just enter your "to" address and "from" address (or use current location) on your device (including iPhone, Android), then select the public transport icon. Metropolitan train, tram and bus services are contracted out by the State Government under the unified brand name Adelaide Metro and use a unified ticketing system, "Metroticket". The Adelaide Metro website or the Passenger Transport InfoCentre (corner of King William & Currie Streets, Adelaide CBD or Adelaide Railway Station, 125 North Terrace, Adelaide CBD) are the places to visit for timetable and route information. A key point for ticketing in Adelaide is that the vast majority of tickets and fares allow the passenger to move freely around the transport network for at least 2 hours. No validations are permitted after 2 hours but the passenger is allowed to remain on the current vehicle if their ticket has already been validated before the 2 hour limit. The off-peak period in Adelaide is between 9:01am and 3:00pm on weekdays, Sundays and all public holidays. Tickets are approximately 30% cheaper during this time. Single trip tickets ($5.40 for adults ($3.50 in off-peak)) allow the passenger to move freely around the transport network for 2 hrs. If traveling often, it is cheaper to use a stored value Metrocard (below). A $10.20 daytrip ticket is available, allowing unlimited travel within the Adelaide Metro area for an entire day. If travelling for 3 days, it may be more economical to purchase a 3 day visitors pass (below). There is a 3 day visitors pass available for $26.60, allowing unlimited travel on the Adelaide Metro network for 3 days. A map and a travel guide is included. If you wish to continue using the ticket beyond the 3 days, more Metrocard credit can be purchased. Single Tickets can be purchased from ticket machines on board trains (coins only), trams (coins or card), or from conductors on the tram or bus drivers. A small number of stations (Adelaide, Gawler, Noarlunga Centre, Oaklands and Mawson Lakes), and a number of newsagents, corner stores and post offices sell & recharge the contactless, stored value Metrocard. If using a Metrocard or visitors pass, you validate by touching against the reader when entering a bus, train or tram - just do what the locals do. Ensure that the light on the machine is green before proceeding. There is no need to touch off. Additionally, you need to validate to pass through the platform gates at Adelaide Railway Station (you still have to validate on the train after going through the barriers). The free City Loop (#99C) bus runs M-F 07:40-18:00 every 15min, F 18:00-21:20 every 30min, Sa 08:00-17:00 every 30min and Su (and public holidays) 10:00-17:00 every 30min. It has clockwise and anticlockwise routes each with about 30 stops taking in all the major cultural and commercial centres, beginning at Victoria Square and including Adelaide Railway Station. The buses have ground-level access ramps. Be warned that bus frequency declines sharply after 18:00, with hourly intervals being typical in the suburbs. All services cease operation around midnight, so check your timetables and expect to catch a taxi if required if you are out after this time. Very basic After Midnight bus services along limited routes operate hourly after midnight on Saturday nights. A tram service runs from the Adelaide Entertainment Centre in Hindmarsh, an inner north-western suburb, to the Adelaide CBD, travelling along North Terrace and King William Street, through the city and then onward to the south west terminating at the popular seaside suburb of Glenelg. You can park in the Entertainment Centre carpark and take the tram into the city, which is more convenient than finding parking within the city itself. Stops within the city centre include Adelaide Railway Station, Rundle Mall and Victoria Square. Tram travel from South Terrace, through the CBD to the Northern Terminus of the line is free., as is travel confined to Jetty Road in Glenelg. Otherwise the standard ticket system applies and the whole trip takes about 30 min. Tickets may be bought in advance or purchased from a ticket machine on the tram (card or coins). The Gawler Line, to Gawler Central in the north of the city. The Outer Harbor Line, which goes up the Le Fevre Peninsula in the north-west of the city via Port Adelaide. A branch extends off this line to the beachside suburb of Grange. The Seaford Line, formerly the Noarlunga Line, which now extends through Noarlunga Centre to Seaford, in the far south of the city, via the beachside suburb of Brighton. A short branch extends off this line to the suburb of Tonsley (which only operates Mon-Fri during business hours and peak hours, except during the AFL season when additional dedicated Footy Express trains run on game day, on all lines). The Belair Line which extends to Belair in the foothills of the Adelaide Hills to the south-east of the city. Visitors may find the Outer Harbor line useful to get to Port Adelaide. Although the station is about 0.5 km (0.3 mi) south of the port area, but is an easy walk up Commercial Road. The Belair Line is useful to access Belair National Park, and the Seaford Line provides access the seaside suburbs of Brighton and Hallett Cove. Some of the larger shopping centres are close to stations. Westfield Marion shopping centre is very close to Oaklands Railway Station, while Noarlunga Centre is next to Colonnades. The city centre is compact and can be easily covered on foot. Most attractions are centered around the blocks between North Terrace and Victoria Square on either side of King William Street. Taxis are provided by several companies and can be hailed on the street or arranged by phone. There is a common rate of flagfall and a per-distance/time charge, both of which are increased at night and on weekends. Uber also operates its service in Adelaide, which was legalised in mid-2017. A taxi fare from the airport to the city will cost between $22 and $28 on weekends and peak periods and between $20 and $25 on weekdays. There is an extra $1 levy on all fares and $3 if the fare starts at the airport. NGO "Bicycle SA" provides a range of bicycle services, including free-to-use tourist bikes, from its offices in Currie Street, next to the Adelaide Central Bus Station. ☎ +61 8 8168-9999. Bicycles can be hired, with the deposit of a driving licence or other ID, for the entire day for free, but must be returned before 16:30 or a $25 fee is payable. Arrangements can be made for bicycles to be hired overnight. A popular ride is to ride from the city centre along the Torrens out to West Beach, then down to Glenelg and back. You cannot take your bike on the Glenelg Tram or any bus, even outside peak hour, however you can take them on trains. An alternative to taking the tram back from Glenelg is to ride a further 20min south along the coast to Brighton Station on the Noarlunga Centre Line where there are reasonably frequent trains back to Adelaide. Although the city centre is easily walked or travelled by public transport, as Adelaide's public transportation network is limited and infrequent outside the city centre and the major transport hubs (like Glenelg), renting a car is the most practical way of getting around Adelaide, particularly if you want to head into the suburbs. All the big international companies such as Redspot, Avis, Hertz have an office at Adelaide airport and there are also depots in the central city area. Pay attention to speed limits. The default metropolitan speed limit, which applies in the absence of any signs, is 50km/hr. Some suburban streets are 40km/hr. Main roads are usually sign posted to 60km/hr. A few road corridors are 70km/hr or 80km/hr, and some freeways are 100km/hr. The maximum speed limit is 110km/hr, found only on South Australian country roads outside of the Adelaide urban boundary. Glenelg, the historic beachside suburb of Glenelg has a jetty, the Grand hotel and many restaurants and cafes. Catch one of the historic trams from in Adelaide's CBD on weekends and holidays or new light rail trams other times. Montefiore Hill, in North Adelaide provides a spectacular view of the city, especially at night. Adelaide Hills, including the Mt Lofty Summit provides spectacular views of the Adelaide plains, Adelaide metropolitan area, Adelaide CBD, Glenelg and surrounding areas. There is a moderately priced restaurant at the Mt. Lofty summit and a souvenir shop which offers tourist information. The summit cannot be accessed by vehicle between late evening and early morning hours, however the lookout is still accessible by foot. Other lookouts include Windy Point along Belair Road, and Skye at the end of Kensington Rd. Hahndorf, originally a German settlement, this a small town that plays on their German heritage. It is a short drive up the freeway, attractions include a small chocolate factory, the Beerenberg Strawberry Farm (where you can pick your own strawberries for very reasonable prices), the home of noted Australian landscape painter Sir Hans Heysen, parks with barbeque facilities and a playground plus many small stores selling all manner of tourist-centric products. Can be very busy on weekends. Regular public bus services take 45 minutes to get there from Adelaide. North Terrace, will take you past the Casino (Railway Station below), Parliament House, Government House, the State Library, Museum and Migration Museum (both free entry), Art Gallery (free entry), Adelaide University, University of South Australia, Ayers House (former home of Henry Ayers), Royal Adelaide Hospital, the Botanic Gardens. It is an attractive tree lined boulevard in a South Australian colonial tradition. Catch an O-Bahn bus out to the North East suburban shopping centre of Tea Tree Plaza. The O-Bahn is a 12 km (7.5 mi) long guided bus way, where special street buses run on guided tracks at up to 100 km/h. It uses the unified metroticket system mentioned above. Port Adelaide, Adelaide's historic harbour town with many historical buildings, pubs, boat cruises and dolphin watching. Southern Beaches, Picturesque Beaches between Christies Beach to Sellicks Beach. Some patrolled and safe for swimming. Many coastal walking trails. Beach Road at Christies Beach has Cafes. Restaurants and Jetty at Port Noarlunga, with snorkelling of the rocky reef wall possible. Onkaparinga River mouth at Port Noarlunga South. Cliff top walks and lookouts. Able to be seen in the same day as visiting McLaren Vale Wine region, by car. One of the best times of the year to visit is during "Mad March", when a multitude of festivals and events are held. These include (see details below) the Adelaide Fringe, the Clipsal 500 Car race, the Adelaide Festival, WOMADelaide, The Adelaide Cup horse racing carnival and the touring Soundwave Future Music Festivals Groovin the Moo and Stereosonic Usually attended by the youth and young adults. Tour Down Under, starts on the 3rd Tuesday of January. It is the inaugural event of the UCI World Ranking calendar, attracting many big name professional teams and is accompanied by community rides. Clipsal 500, During mid-March, the Clipsal 500 supercar racing event is very popular, sporting massive street parties, huge concert line-ups and many fanatic Adelaidians. Adelaide Fringe Festival. During late Feb-Mar, the Fringe Festival (second largest of its type in the world) and Festival of Arts bring the city alive with music, art, circus, comedy, theatre, dance and culture from throughout the globe. Both are large and very popular events visited by people from all over the world. WOMAD, (World of Music Arts and Dance) is another hugely popular music festival now held every year in March. People come from all over Australia and overseas to be at this very special event. Adelaide at its very best. If you are planning on visiting Adelaide make sure to come at this time of the year for an unforgettable time when Adelaide is at its brightest. Royal Adelaide Show. The state agricultural show, where country meets city, good for the cowboys, side show alley as well as the show bags! Adelaide Zoo (Adelaide and Monarto Zoo), Frome Rd. Daily 09:30-17:00 (including Christmas). The only place in Australia and one of only a few in the world to see giant pandas. Migration Museum, Kintore Ave (Behind the State Library). Daily 10:00-17:00 but closed Good Friday and 25 Dec. Learn about the history of different migrants across the centuries and South Australia's heritage and present as a state of migrants. Art Gallery of South Australia, North Terrace (Half way between Kintore Ave and Frome Rd, between the South Australian Museum and the University of Adelaide), ☎ +61 8 8207 7000. Daily 10:00-17:00 but closed 25 Dec.
South Australian Museum, North Terrace (Next to the Art Gallery of South Australia). Daily 10:00-17:00 but closed Good Friday and 25 Dec. Many different exhibitions, for example South Australian biodiversity, animals, Antarctic explorers, ancient Egypt, Pacific cultures. Gawler Museum, via Gawler train line. South Australian Maritime Museum, 126 Lipson St, Port Adelaide. ☎+61 8 8207-6255. $8.50, concession $6.50, child $3.50, family $22 (2 adults & up to 5 children). Daily 10:00-17:00. Australia's oldest maritime museum. Learn all about ships and wrecks and Port Adelaide's dolphins in an atmospheric historical building. National Motor Museum, Birdwood. Large automotive museum collection less than 1 hr drive from the city centre. Bicentennial Conservatory. The largest single span conservatory in the Southern Hemisphere. Belair National Park is a national park of 835 ha, 11 km (7 mi) south of Adelaide City. 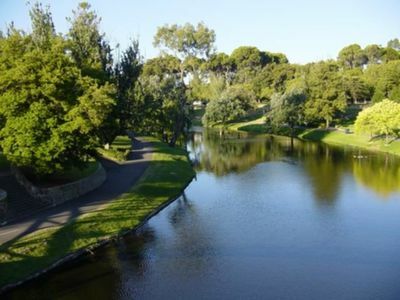 Due to its history as a "Recreation Park" it has many good trails for bushwalking, as well as tennis courts and grassy areas available for hire, and a good adventure playground for children. Old Government House, the colony's first official Vice-regal summer residence, is located within the park. A vehicle entry fee applies to cars entering the park, or else its western parts can be accessed from the Belair line train, a 35 min journey from Adelaide city. Gates open 08:00-sunset, except 25 Dec.
Cleland Conservation Park  is a large National Park of 992 ha (2,450 a), located 20 min from Adelaide City. Although it lacks the picnic and sports facilities of Belair, Cleland offers greater opportunities for tourists to get up close and personal with Australian native fauna. 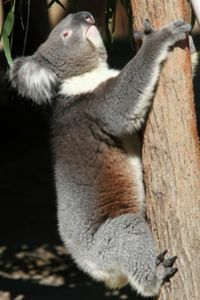 Visitors can feed and wander at their leisure among kangaroos, wallabies, Emus and waterfowl. Displays of Dingoes, reptiles, Tasmanian Devils, Wombats, Echidnas and Koalas allow easy viewing access, or stroll through the aviaries. Visitors also have the rare opportunity to be photographed holding a Koala, under supervision from Parks and Wildlife Officers. There is also an Aboriginal cultural tour. Morialta Conservation Park is located 10 km (6 mi) north-east of the CBD, where the suburbs meet the Adelaide hills. It covers 533 ha (1,317 a), and contains numerous walking trails of various levels of difficulty, including trails that pass by three major waterfalls, and provide panoramic views over Adelaide itself. There is also a popular rock climbing area within the park. Note that the waterfalls only flow in the winter months, and are usually completely dry by Christmas. Adelaide is called the City of Churches, although the locals say that there are definitely more pubs than churches! Haigh's Chocolate, Greenhill Rd, Unley Park. A factory tour. Haigh's was established in 1915 and is one of the best chocolate makers in Australia. 5 min from the CBD, the tour will give you a glimpse on how this fine chocolate is made and they give free samples. M-Sa at 11AM, 1PM and 2PM, free but bookings essential. The Adelaide Casino, on North Terrace, adjoining the Festival and Convention Centres. Adelaide Casino is South Australia's only licensed Casino operated by Skycity, and offers not just great gaming and betting facilities but also offers two outstanding restaurants, cafes and bars, including the popular Sean's Kitchen, Madame Hanoi and Grandstand sports bar. Valet parking and cloak services are also available. The Adelaide Botanic Gardens, are free to enter and are a worthwhile visit; the gardens are quiet and relaxing even though they're in the heart of the city. They contain many large grassed areas ideal for relaxing, and just outside the gardens are the city parklands where ball games and picnics can be held. There is a cafe in the gardens and a conservatory. The Bicentennial Conservatory is free, and it is a worthwhile visit, simulating a tropical rainforest with mist falling from the roof. Be warned, it is warm and humid inside. 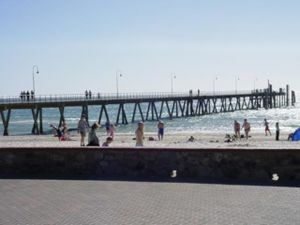 West Beach is ideal for family walks and swimming - it is close to both Glenelg and Henley Beach. At Henley Beach there is Henley square which hosts some 15 restaurants - an excellent dining venue. Beaches south of and including Semaphore are all excellent white sand beaches, some with public toilets and cold water showers/taps. If you want to 'wet a line' there are jetties at (suburban beaches, from north to south) Grange, Semaphore, Henley Beach, Glenelg, Brighton, Port Noarlunga, Moana Normanville and Second Valley. Adelaide Oval, During the summer months get down to the Adelaide Oval for a cricket match. Australia plays host to a couple of touring nations each summer and they will play a few matches at this beautiful ground which is just minutes from the city centre. Tickets for internationals tend to be snapped up quickly, but domestic matches are frequent and equally exciting. AFL, The local sport is Australian Rules Football. Home games for the local teams the Adelaide Crows and Port Adelaide Power are played at the newly refurbished Adelaide Oval on the outskirts of the city. Getting tickets shouldn't be a problem - check out the AFL website  for more details. SANFL, Alternatively, the local footy league, the SANFL , has 5 games per weekend. Norwood Oval, home of the Redlegs , is situated on the Parade in Norwood which is home to a variety of restaurant, café and pub options for after the game. Other popular local football clubs include Port Adelaide Magpies at Alberton Oval (Port Adelaide), Sturt (Unley Oval), Woodville-West Torrens (Woodville Oval) and Central District in the northern parts of Adelaide. Soccer/Association Football, increasingly popular in Australia, although certainly not yet at the level of Aussie Rules Football or (in other states) Rugby League. The local team in the national A-League is Adelaide United, who play home games at Cooper's Stadium also locally known as Hindmarsh Stadium with a capacity crowd of 16,500. Hindmarsh Stadium is a 200m walk along Crawford Lane from the Adelaide Entertainment Centre Tram Terminus. Coopers Brewery , the only remaining large family owned brewery in Australia, well known around the world for their bottle conditioned ales. Founded by Thomas Cooper in 1862, the Brewery is currently run fifth generation Tim and Glenn Cooper. Take a tour, all proceeds from the tours go to charity. Rundle Mall, . A pedestrian-only shopping strip, with many arcades and side streets coming off it. Runs parallel to North Terrace. Over 800 shops. Rundle Mall is a very popular meeting place for locals to catch up and shopping, other shopping districts within the CBD include Rundle Street (for boutique designer labels), Hindley Street (west end), O'Connell and Melbourne street (North Adelaide) and Adelaide Central Markets (off Victoria Square). Tea Tree Plaza,  (TTP for short) is a medium-sized shopping centre with over 250 shops. Tea Tree Plaza is the terminus of the Adelaide O'Bahn dedicated busway which begins in the city centre at Hackney Rd. It is easy to get there from the city centre; most of the buses that stop on the Grenfell St stops travel to the TTP interchange  via the O'Bahn busway. It is easy to see from a distance as it has the large antenna and supporting pyramid type structure, well-known to the locals, on the roof of the Myer department store. Ample parking is available around, on top of, and underneath the complex. The much smaller Tea Tree Plus shopping centre is right next to Tea Tree Plaza. Westfield Marion Shopping Centre, . Adelaide's largest shopping centre with over 400 shops which major government, medical, community and leisures services. Marion is one of one Australia's largest shopping centres. There are buses  direct from the city centre. Westfield West Lakes Shopping Centre, . Located in the heart of western suburbs of Adelaide is another large popular shopping and leisure precinct along side the old Football Park, buses with regular services connect visitors to West Lakes and it's nearby area contact Adelaide Metro for further information. Harbour Town, . Mid sized mall currently undergoing an expansion, featuring outlet shopping, situated up against the western edge of the Adelaide Airport. Only a short bus ride from the Airport, and 30 min from the city centre. Colonnades, . Major Shopping Mall in the southern suburb, Noarlunga. Easy train ride straight to Noarlunga Centre Interchange (train station), right next door. Free Wifi. Close to Library, Movie Cinema, Bowling Alley, Public Pool, Hospital and Doctor Clinics, and many many shops. Short walk down Beach Road via Cafes to Christies Beach. Other major shopping and leisure precincts include ""Burnside Village"" on the affluent side of Adelaide's eastern suburbs, ""The Parade at Norwood"" five minutes east from CBD, ""Arndale Shopping Centre"" situated in the western surburb towards Port Adelaide. ""Elizabeth Shopping Centre/Munno Para"" in far northern area of Adelaide, ""Unley Road"" just of the city, its the other boutique shopping area of Adelaide and ""Mile End"" mainly selling homewares and industrial products just off the city towards Henley Beach and Adelaide Airport. The Central Market  offers fresh produce and a range of goods, with cheap multi-storey parking. Closed M Su. Btwn Grote and Gouger Sts, west of Victoria Sq. Chinatown, a pedestrian-only area (Moonta St) adjacent to Central Market. City East IGA the fine food store 116 Hutt St, ☎+61 8 8223 1112. Won best IGA Supermarket in SA for its amazing food range, including: Greek, Italian, Chinese and Indian. Many restaurants in Adelaide allow "BYO". You can bring one or more bottles of wine to the restaurant and the staff will pour it for you and add a service charge to the bill, typically between about $8-20. Often this will work out cheaper than buying wine at the restaurant. Check beforehand with the restaurant. Making a reservation or group booking is considered polite and essential within Adelaide's pub and restaurant scene. Gouger Street offers a wide range of tastes to suit many budgets in a variety of Asian, Italian and seafood restaurants as well as upmarket French, Argentinian and many other choices. From Friday to Sunday make sure to reserve a table to avoid disappointment. Gouger Street also incorporates Adelaide's "Chinatown Arch" which fronts a large number of budget eating options. As well as The Central Market, which on Tuesdays, Thursdays, Fridays and Saturday mornings are buzzing with produce traders, sights and smells. Hutt Street Offers a small variety of upmarket restaurants that please most tastes, and also has a wide variety of gourmet shops and supermarkets. Rundle Street a large number of al fresco cafes and restaurants of varying budget and taste. It is the cultural hub of Adelaide and the equivalent of Melbourne's Chapel Street. An eclectic mix of small restaurants and cafes make Melbourne Street an interesting place to eat. The variety of take-aways, pubs, cafes, bakeries and restaurants that line most of O'Connell Street means you won't be wanting. The Parade, Norwood has a long stretch of shopping and cosmopolitian dining. Buses from the CBD numbering 122-124 or a very short taxi ride. Jetty Road / Mosley Square, Glenelg has a variety of restaurants and pubs at the end of a 30 minute tram journey. Stuart Road, Dulwich features two cafes, a licensed restaurant and a very good bakery. Catch the 145 or 146 from North Ter which heads along Fullarton Rd and up Dulwich Ave.
King William Road, Hyde Park is an upmarket strip of fashionable cafes, coffee shops and restaurants. Port Noarlunga, 35 minute drive South of Adelaide. A few nice eating options, including a popular Mexican Restaurant 'Tequila N Tacos'. Nice to walk to the Beach and Jetty before or after. Alfonzo 202 Hutt St. An Italian eatery and shop; a great place to enjoy breakfast and lunch any time of the day. Elephant walk 76 Melbourne St, +61 8 8267-2006– particularly interesting because it is a small, cosy cafe which is very dimly lit. Each booth is separated by straw screens so you can't really see the other patrons. It opens at 8PM and if they're full, you'll have to wait outside for a table. Dumpling King & Charlie's Shack, Corner of Grote and Moonta Sts. Plates of 10-15 dumplings, steamed/friend, pork/chicken and prawn, for $6.80-7.80. Charlie's Shack has pho, laksa and other soup noodles at reasonable prices. Food courts off of Moonta St, Many different Asian cuisines at cheap prices. All you can fit on your plate for varying prices plus made to order food. Hawker's Corner, 141 West Terrace, cnr Wright St. Much the same as the food courts but open at night. Cheap but tasty with a wide range of food. Indiana Takeaway, Budget Indian food, located on the intersection of Marion Rd and Richmond Rd. From under $10. Cafe de Vili, '2-14 Manchester St. (Off South Rd, after Richmond Rd). Vili is an Adelaide producer of pastries, especially pies and pasties. This unpretentious eatery at their factory serves full meals in addition to pastries. Shift workers and night owls regularly eat there because it is open 24 hr, 7 days. It is a minor Adelaide icon. Fasta Pasta, is the McDonalds of pasta; although found in other states its popularity in South Australia is due to the chain having started in Adelaide. Expect to pay from $10 for a plate of pasta. There are actually a lot of budget eateries in Adelaide. They don't usually look like much from the outside but most have something going for them - the reason that they are still in business. It pays to look through menus plastered onto doors. Cheap eats should be anywhere from $8-14 for a main, and no more. Amalfi, 29 Frome St, ☎ +61 8 8223 1948. This little Italian place located just off Rundle St has a loyal following and is usually jam packed. It has an inventive range of pizzas and pastas, with quality a cut above the other Italian cafes filling Rundle St. Chefs Of Tandoori 292 Unley Rd, ☎ +61 8 8373 5055. As the name suggest, founded by Indian chefs who deserted the Tandoori Oven across the road. Good Indian food at a very reasonable price. Concubine 132 Gouger St, ☎ +61 8 8212 8288. Amazing modern contemporary Chinese/Thai but very affordable. Fellini, 102 O'Connell St, ☎ +61 8 8239 2235. Large North Adelaide cafe is packed to the rafters every weekend. The menu is Italian-based pasta, pizza and so on, but what keeps the punters coming back is the large size of the menu and inventiveness of the dishes. Jasmin, 31 Hindmarsh Sq, ☎ +61 8 8223 7837. Arguably Adelaide's best Indian restaurant. Beautifully decorated, with classical music playing and impeccable service. The very hot curries (vindaloo and tindaloo) are especially good. You might also consider trying the mixed entree or orange sponge cake. Kenji Modern Restaurant, 242 Hutt St,☎ +61 8 8232 0944. Nominated as the best Japanese restaurant in Adelaide. La Trattoria, 346 King William St,☎ +61 8 8212 3327. Italian restaurant and pizzeria since 1975. Traditional food served by a larger than life Italian family. Open til late. Nu Thai, 228 Morphett St, ☎ +61 8 8410 2288. Slightly more expensive than Regent, with a more adventurous menu. They have a huge blackboard inside with a long list of specials which change regularly. The Queen's Head Hotel, 117 Kermode St, ☎ +61 8 8267 1139. This little trendy pub place located just off King William St and Adelaide Oval (Cathedral End) has a quality award-winning range of pizzas and wine selection, popular drinking and eating hole before and after an AFL game during winter months. Raj on Taj, King William Rd, ☎ +61 8 8271 7755. Good, reasonably priced Indian food. There are two Raj on Taj restaurants, one in Hyde Park and one nearby in Unley. The Hyde Park one is the better of the two. Regent Thai, 165 O'Connell St, ☎ +61 8 8239 0927. Excellent and consistent standard Thai menu. The friendly proprietor Chang was a refugee from the Khmer Rouge in Cambodia. Try the oysters in coriander sauce, the red curry chicken, or ask for a whole fish steamed with ginger and shallots. Its sister restaurant at Glenelg, Phuket, is worth checking out as well. Mains $13-18. Enoteca 262 Carrington St,  ☎ +61 8 8227 0766. This restaurant is attached to Adelaide's Italian Club, so you would expect top quality Italian food along with an extensive selection of local and Italian wines. Magill Estate Restaurant, 78 Penfold Rd, Magill,  ☎ +61 8 8301 5551. While the food here is good, the real stars are the view and the wine list. This restaurant is owned by Penfolds, probably Australia's best-known premium red wine maker, and overlooks the vineyards on their Magill property, not far from the city centre. The grapes grown on this estate are used to make the Magill Estate label single vineyard Shiraz. The wine list allows you to order back vintages of the Penfolds and other wines going back 20 or more years. Windy Point Restaurant, Windy Point Lookout, Belair Rd. ☎ +61 8 8278 8255. Nice ambiance, excellent service and good food prepared in a unique way with a nice view of the city skyline. For those who wish to have a less formal setting, the adjacent cafe also offers a good selection. Usually only open for dinner from 6PM onwards, though lunches are possible with prior arrangements. Red Ochre,War Memorial Dr, North Adelaide. ☎ +61 8 8211 8555. Modern Australian restaurant with a nice ambience situated on the River Torrens and with a good view of the city skyline. Shiki Restaurant, (Intercontinental Hotel Adelaide), North Ter. ☎ +61 8 8231-2382. Japanese restaurant with a nice atmosphere in one of Adelaide's premier hotels. Mainly known for it's teppanyaki but also serves other Japanese dishes like sushi, sashimi and tempura. Press* Food and Wine, 40 Waymouth St, , ☎ +61 8 8211 8048. Trendy modern Australian restaurant with a regularly changing locally-sourced menu and extensive wine list. Long benches downstairs for casual dining (no reservations), upstairs for formal seating (reservations taken). Expect a wait on a Fri/Sat night if you're looking to sit downstairs. Smoking in pubs and clubs is banned under South Australian law. Many drinking establishments have outdoor areas where smoking is permitted. Grandstand, Adelaide Casino, North Ter, ☎ +61 8 8212 2811. Su-Th 10AM-late, F Sa 11AM-5:30AM. Situated on the 1st floor of Adelaide Casino, Grandstand is Adelaide's premier venue for watching all live sporting events. Featuring several TV screens showing all the action from Fox Sports, Setanta and Main Event, Grandstand also has full Keno and TAB facilities. A bar menu is also available, as are regular great drink promotions. Crown & Anchor, 196 Grenfell St, ☎ +61 8 8223 3212. M-W 11AM-3AM, Th-Sa 11AM-4AM. Situated just off Rundle St, this Adelaide institution is often referred to as "The Cranker", or less kindly, the "Crowd of Wankers" attracts those of an alternative bent. Goths, metalheads, punks and hippies all mingle in this multi-roomed venue, sipping beer. But don't worry, piercings and tattoos aren't essential to have a good time. Music playing could be just about anything. Worldsend, 208 Hindley St, ☎ +61 8 8231 9137. M-F 11AM-late, Sa 4PM-late, Su closed. Serves food all day. This lively pub features a beer garden and a solid restaurant. The crowd is generally early to mid 20s, many from the nearby Hindley Street campus of the University of South Australia. While it definitely has a strong pub feel, the music is more like a bar, with live jazz and funk, house and drum'n'bass (rather than rock) the order of the day. The Exeter, 246 Rundle St, ☎ +61 8 8223 2623. This friendly old-school pub is much frequented by students from nearby Adelaide University and TAFE. At night, it has an alternative feel drawing crowds from all areas. Two back rooms contain a great little restaurant. The curry nights on Wednesday and Thursday are popular. Small music venue, mostly showcasing live alternative bands. M-Su 11AM-late. The Archer, 60 O'Connell St, ☎ +61 8 8361 9300. Modern, hip feel and a large range of beers on tap. Be aware that it has to close earlier than most places (usually midnight) due to residential noise restrictions. The Cumberland Arms, 205 Waymouth St, ☎ +61 8 8231 3577. M 9AM-midnight, Tu 9AM-1AM, W-Th 9AM-3AM, F Sa 6PM-4AM, Su 6PM-2AM. Located in a strip of bars and clubs along the southern end of Light Square adjacent to Hindley St. The Cumberland was bought out and refurbished some years ago. Nowadays it's a cozy spot which does a good job of being all things to all people. The front bar areas conceal a dance floor within, where a DJ is invariably playing house, and an outdoor area around the side. The popularity of "The Cumby" is cyclic, but if it's not happening, one of the adjacent places will be. The Grace Emily, 232 Waymouth St,  ☎ +61 8 8231 5500. (Opposite "The Cumberland). The Grace has plenty of trinkets behind and around the bar to keep one's eyeballs busy whilst nursing a Coopers or bloody mary. Local, interstate and overseas bands play most nights. Every Monday night Billy Bob's BBQ Jam sees a variety of local bands strut their stuff to impress the crowd with 3 or 4 songs (though perhaps more by popular demand) whilst a sausage sizzle out the beer garden feeds the hordes - a highlight of an otherwise quiet evening in Adelaide. The Austral, Rundle St. . On the main street for shopping and nightlife in Adelaide, which is really the same long street as Hindley St but with a different name either side of King William Road, and the pedestrian only Rundle Mall in the middle. The Austral is the unofficial backpackers pub of choice, but still very popular with the locals. Coopers Alehouse, 316 Pulteney St,  (Also known by the original name still on the front facade The Earl of Aberdeen). The only pub to hold the complete range of Coopers Beers on tap, including the Vintage Ale. Also serves good food, including pizzas, in the attached Arnou Woodfired at the Earl restaurant. 10 min walk from the Rundle St-Pulteney St intersection. Clever Little Tailor, 19 Peel St, , Cosy little bar on the quiet Peel St, just off of Hindley St, with a great selection of wine, beer and liquor and bartenders who know their stuff. Great interior with casual bar seating and a few tables on the upper level. Udaberri, 11 Leigh St, , Small double-level bar on Leigh St, packed on weekends with a fashionable crowd. Great for beer, wine, well-made cocktails and a bite to eat. First,' 128 Rundle Mall, ☎ +61 8 8223 4044. (In the Richmond Hotel), The only nightspot on Rundle Mall. First started life as a chilled out cocktail bar, but rapidly became popular as an after-work spot on Fridays, and could now also be filed under "clubs". On weekends they are packed out and play commercial house, but on weeknights it reverts to the original cocktail bar atmosphere. Fumo Blu, 270 Rundle St, ☎ +61 8 8232 2533. Below ground cocktail lounge in the heart of Rundle St.
Supermild, 182 Hindley St, ☎ +61 8 8212 9699. Situated underground (Look for steps leading down off Hindley Street West). A dimly-lit, chilled out cocktail bar with a popular beer garden out the back. DJs have eclectic electronica tendencies. Rocket Bar, 142 Hindley St, . Inconspicuously located on Hindley St (it's a door with a sign above it). Live venue hosting international/interstate and local alternative indie acts. Also home to indie/alternative Modular nights and CATS on Fridays. Boasts an open-air rooftop space with a complete bar and tropical atmosphere. Open every weekend until late. HQ,  1 North Tce, ☎+61 8 7221 1245, (Previously known as "Heaven" and "Heaven II"), A complex at the far end of the West End with the best sound system and most floor space to be found anywhere in the city. It is easily Adelaide's largest club. The big nights are Saturday, where you'll hear mostly commercial house, with a little trance, and Wednesday, which is a retro night. Fridays can also be big, depending on what's on. Mars Bar, 120 Gouger St, ☎ +61 8 8231 9639. Adelaide's only gay club. Straight people are also welcome. Sugar, 274 Rundle Street, Adelaide, ☎ (08) 8223 6160. An above-ground nightclub most popular for its hip-hop/RnB nights every Wednesday. Sugar plays an eclectic variety of music depending on which night of the week you attend, and tends to be open most nights of the week. There are several pool tables away from the bar and dance floor in the case that you feel like a quick game. There is a choice of backpacker accommodation around the central bus station. Adelaide Travellers Inn, 220 Hutt St, ☎ +61 8 8224 0753. ([email protected]) . Adelaide Central YHA, 135 Waymouth St, ☎ +61 8 8414 3010 (fax +61 8 8414 3015, ([email protected]), . $25.50 per bed per night in a dorm room, $75 for a private double room and $90 for double en suite. YHA/Hostelling International members receive a 10% discount. My Place Adelaide, 257 Waymouth St,  ☎ 1 800 221 529. Very clean, good social vibe, free breakfast & free bus to Glenelg beach. The Austral, 205 Rundle St,  ☎ +61 8 8223 4660. The Austral is a pub which provides accommodation upstairs from the bar area. Rooms are clean and fairly quiet despite the bar downstairs, although the mattresses aren't great quality. Bathrooms are shared. Close to Adelaide's centre. $40 single and $55 double. Plaza Hotel, 85 Hindley St, ☎ +61 8 82316371 (fax +61 8 8231 2055, [email protected]) . Single rooms $66/night, double rooms $72/night. Cannon Street Backpackers, (Across the Flinders Street Bus Terminal). From $21 with in house bar. Lots of Irish and English backpackers that like to party hard, so place tends to be on a bit noisy. Blue Galah, Rundle St, CBD, ☎ +61 8 8231 9295 (fax +61 8 8231 9598, [email protected]) . $24/night in a dorm room, $70/night for a private single/twin/double room, weekly dorm rates are also available. Hostel 109, 109 Carrington St,  ☎ +61 8 8223 1771. Small, quiet, modern, secure & centrally located. Very clean. Free internet. Frogmore Apartments 13 Military Rd West Beach. ☎ +61 8 8353 3874. Close to beach with excellent Mt Lofty Range views). Apartments one bedroom from $75 per night and two bedroom from $90 per night, three bedrooms from $110 per night. Rydges South Park Adelaide, 1 South Ter ☎ 1300 857 922. Next to the Southern parklands with views of the Adelaide Hills and features 97 rooms with 9 spa suites. The Australia-wide emergency number is 000. The ambulance service, fire service and police are available through this number. As with any city, people should exercise personal safety, particularly at night. The city park lands are poorly lit and are best avoided after dark due to the presence of intoxicated people. Robberies have known to occur in these areas. If you need to cross the park lands to reach the suburbs, stay near the road. Catching a taxi or public transport is recommended at night. When catching a train at a suburban station, it is best to arrive at the station within 1-2 min of the scheduled arrival time. Trains in Adelaide are generally reliable and arrive and depart on schedule. There are security guards on all trains after 7PM and many rail services have bus connections available. Exercise personal safety in and around train stations. At night police actively patrol the city centre, especially Hindley Street where most of the city's nightclubs and bars are located. Taxi ranks are located near the Adelaide Casino on North Terrace, the Hilton Adelaide Hotel on Victoria Square, and the junction of Rundle Street and Pulteney Street outside the Hungry Jacks fast food outlet. Remember to lock your car and avoid leaving valuables in view in unattended vehicles. Pickpockets are rare and there are no "hotspots", but opportunistic theft does happen. Do not leave valuables unattended. When swimming at the beach leave one person on shore to look after your things. Avoid walking at night in outer suburbs known for having higher crime rates, most notably areas like Elizabeth and Salisbury (20km north of the CBD), and Hackham and Noarlunga (25km south of the CBD). The most publicised criminal element are youth gangs that commit robbery and vehicle theft. They tend to be more opportunistic and target people in the wrong place at the wrong time. It's advised you don't walk alone in these areas, This heightens your chance of being a victim. There are bikie gangs but they tend to conflict with each other more than with the public and are kept in check through dedicated police operations. If common sense is used, Adelaide is a very safe city overall on a global scale. Adelaide Hills, McLaren Vale, Barossa Valley and Clare Valley, Wine regions. Kangaroo Island, Explore the natural environment. Victor Harbor, just an hour or so drive south of Adelaide. Granite Island is one of the few places you can see Fairy Penguins in their natural habitat. Visit the nearby surf beaches in Pt Elliot, Middletown and Goolwa. Whispering wall, at the Barossa Reservoir. Yorke Peninsula is a popular holiday destination for Adelaidians, and less touristy than Victor Harbour, with towns dotted along the coast and the rugged Innes National Park at the foot of the peninsula. Alice Springs, 1,500 km of driving. Main stops on the way are Port Augusta and Coober Pedy. Eventually, heading through the Northern Territory you will reach the turn off to Uluru. Melbourne, via Coorong National Park, followed by the Limestone Coast and finally the Great Ocean Road before arriving in Melbourne. Eyre Peninsula, Visit the historic town of Port Lincoln where you can see the massive tuna farms as well as going diving with Great White Sharks (in a cage) or swim with the dolphins and the seals. This page was last edited on 26 January 2019, at 02:48.